The scene is derived from Plutarch’s Life of Pompey, chapter 80, where he describes Caesar’s feigned horror on being presented with the head of Pompey who had been assassinated in Egypt on the orders of Ptolemy. 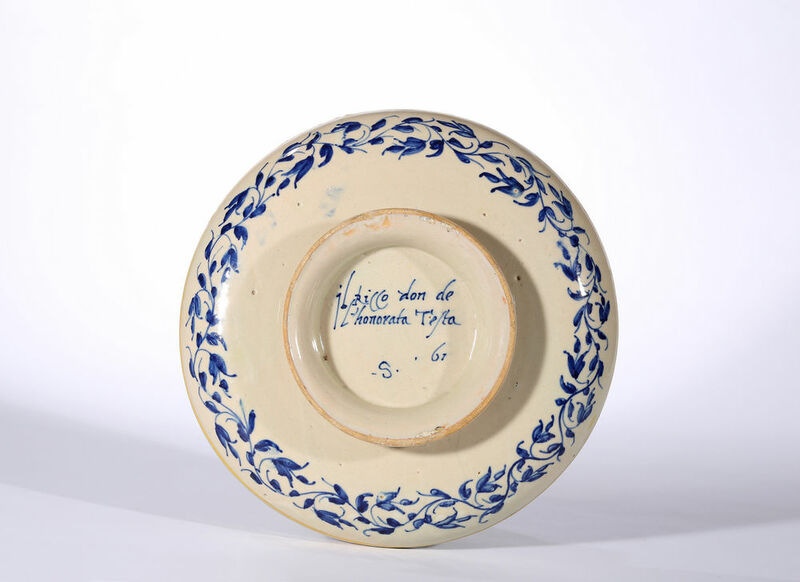 A dish with the same scene is illustrated in Italian Renaissance Ceramics: A Catalogue of the British Museum Collection, where Dora Thornton and Timothy Wilson remark that the inscription on the reverse is derived from one of Petrach’s Sonnets: ‘Cesare, poi che’l traditord’Egitto li fece il don de l’onorata testa calando l’allegeazza manifesta pianse per gli occhi fuori come è scritto’, these were popularised by the painter Francesco Xanto Avelli, despite of this, they say that no version of this subject by Xanto is known. 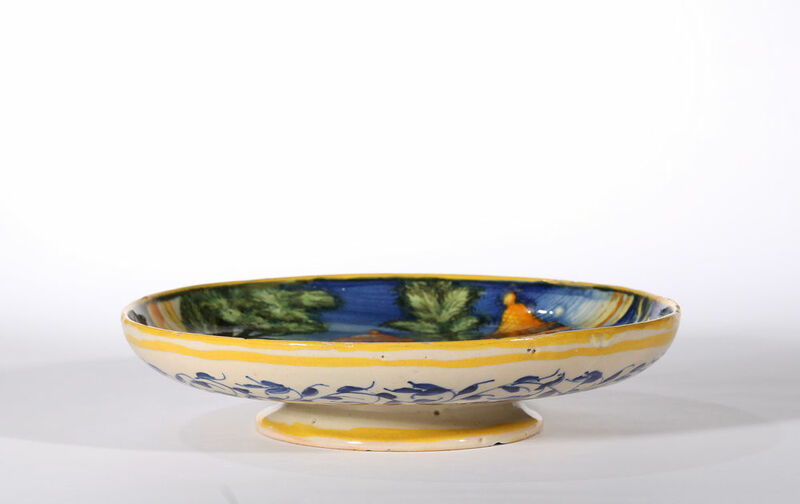 When this dish was painted, Sforza di Marcantonio was working in Pesaro, he was however originally from Casteldurante and is known to have been with Xanto in Urbino as early as 1535. He often continues to use compositions and print sources that can also be found on pieces by Xanto. 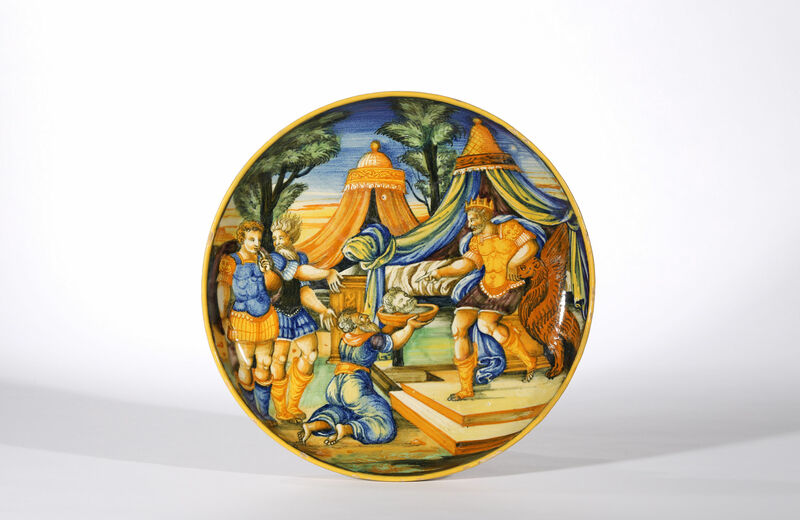 Although we have not been able to find the same composition, we have been able to find all of the characters used on this dish on signed pieces by Xanto. Condition – Restoration to four chips on rim, crack in border stabilised.